The Hills Are Burning: Expect The Unexpected. "Ugh... I'd hate to make you guys lay out all that extra cable they probably won't use, but you know if we don't do it, they're going to call for it." I nod in agreement with my Best Boy. It seems like almost everything we do is, "just in case." We bring lights to set with a scrim bag and gels "just in case" the Gaffer will call for them. We run more cable than we need to from the generator "just in case" they need more light when we actually shoot. We order more gear than originally counted for on the tech scout "just in case" things change. Best Boys often schedule more time than we actually need to do a pre-rig "just in case" something unexpected pops up. Most of the time, all that extra prep is for nothing. But it's invitable that the second we don't take those extra steps, the Gaffer will call for those scrims, they'll need the extra cable capacity or something will go wrong on the pre-rig. It's the Murphy's Law of the film business. 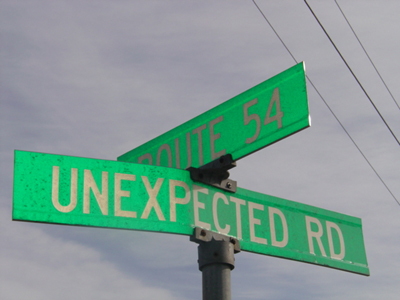 And more and more, I've been finding that this "expect the unexpected" attitude translates to my everyday life. There's no guaranteed days off in my line of work. Even if you have nothing booked on your calendar, that doesn't stop the last minute calls for work from coming in. So if I have a day off, I try to take advantage of the free time and get certain things done, ASAP. Like going to the store or doing laundry. Or those things that I can only do from 9-5, like going to the bank or post office. Usually, I'll get all that stuff out of the way first, and I'm able to enjoy the rest of my time off. But recently, I needed some work done on my car. Feeling kind of exhausted from the recent harvest of work, I decided to just do nothing on my first day off and take it easy. Later that night, I got a call for work that started the very next day, which of course, I took. "My car can wait one more day," I thought. Only that one day of work turned into a few weeks worth, causing me to delay bringing my car to the auto shop way longer than I originally expected. It eventually got to the point where I'd pray to the Car Gods that my jalopy would get me where I needed to go every time I started the engine. Yikes. I don't know about you, but I tend to stress out at the thought of not having a way to get to work everyday. Then word came that the job I was on would last for at least another month and I realized that I needed to make alternate plans if I didn't want to end up a pedestrian in L.A. So I started thinking of ways to get it done. The auto shop I usually go to is only open when I'd be working, so I started to look into other places in the area. I looked at the possibility of finding a place near work where I can maybe drop it off on my lunch break and pick it up when we wrapped. I even went as far as crafting a plan that involved getting a rental car and/or a friend or two giving me a ride. At this point, despite me kicking myself for not taking care of this when I had a chance, I not only had a plan to finally get my car worked on and still make it to work myself, I had a couple of contingency plans as well. But then, true to the laws of Hollywood, once I got something figured out, things started changing again and the extra month of work I had suddenly turned into none. The production had run out of money and I was laid off. Damn. Oh well. At least now I can get my car fixed! So bright and early the next morning, I dropped my car off at the auto shop and breathed a sigh of relief as I continued to do the usual mish-mash of mundane errands, like going to the store, post office and bank, "just in case" I suddenly got called for work again. It's another variation of the Umbrella Rule: if you take an umbrella when heading outside in the winter, it won't rain. If you don't, it will. Happens every time. "Keep On Trying, Charlie Brown."